Confession. I am not a Happy Hour Honey, although I am marrying one, thus giving me the credentials to write a small guest piece on the blog, right? While I won’t live up to their writing prowess, I’m hoping to not completely embarrass myself when I tell you about my recent trip to Kona, Hawaii for the Kona Brewers Festival and the amazing dinner I had at the Kona Brewery. Being a cold-blooded Scandinavian, I had always tried to avoid hot places such as Hawaii. 80 degrees? No thanks. But after a few years of avoiding the islands and the promise of beer, I finally got myself on a plane to Hawaii to meet some old friends for a week of sun, culminating with the Kona Brewers Festival. Our first goal of the week was check out what the local breweries had to offer, thus bringing us to our evening at Kona Brewery. 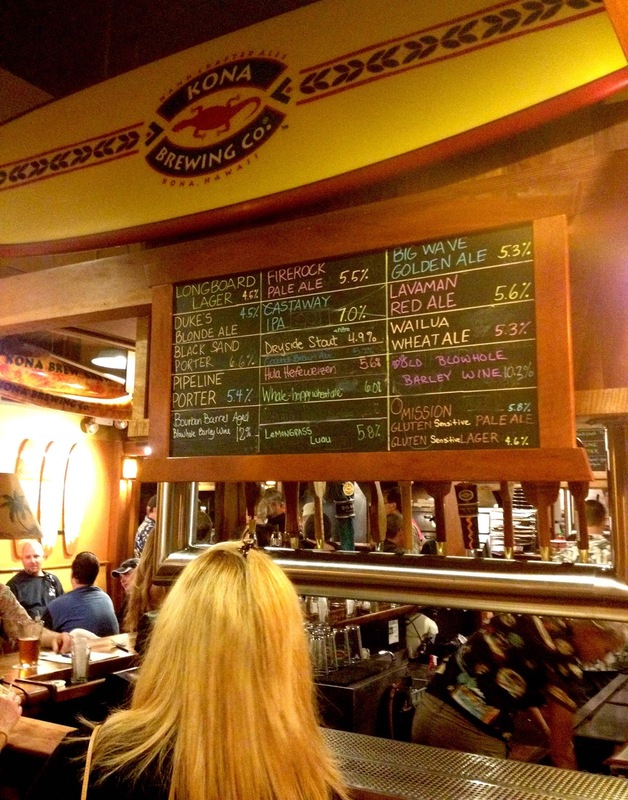 As a Northwest native, knowing beer and pub food is a must. I have been to my share of brewpubs and consider myself well-educated in what to normally expect food-wise at such establishments. 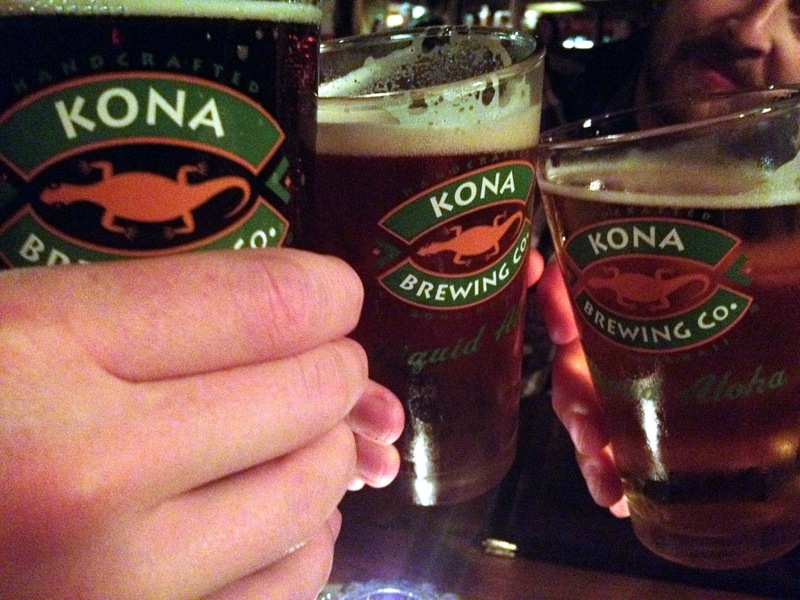 Kona Brewery was far from the norm when it came their food. While they did serve the standard nachos and wings, what really stood out was their creative take on old classics and their locally-influenced plates. We started with a round of beers, both house exclusive and flagship. The Fire Rock Pale Ale and Duke’s Blonde Ale were both tasty but as a group it was decided that the Castaway IPA was the surest of bets. A full-bodied IPA, it didn’t kick you in the face with hops but it didn’t overpower you with maltiness. This high in alcohol (7.0%) but easy to drink IPA we continued to drink at various Island bars throughout the week because we liked it so much. To accompany this, we ordered plates of the Naalehu Nachos ($10) and the Chipotle Chicken Dip ($12). The nachos were huge and a very standard but good choice. Our second plate, the Chipotle Chicken Dip, was fantastic. Just a explosion of cheesy chicken-y spicy goodness. Even my “lactose cautious” friend couldn’t resist. The heat from the jalapenos and chipotle did a number on us and we ended up getting another round of drinks and a plate of the Pawai Pepperoni Rolls ($8). The pepperoni rolls were my favorite food of the night. 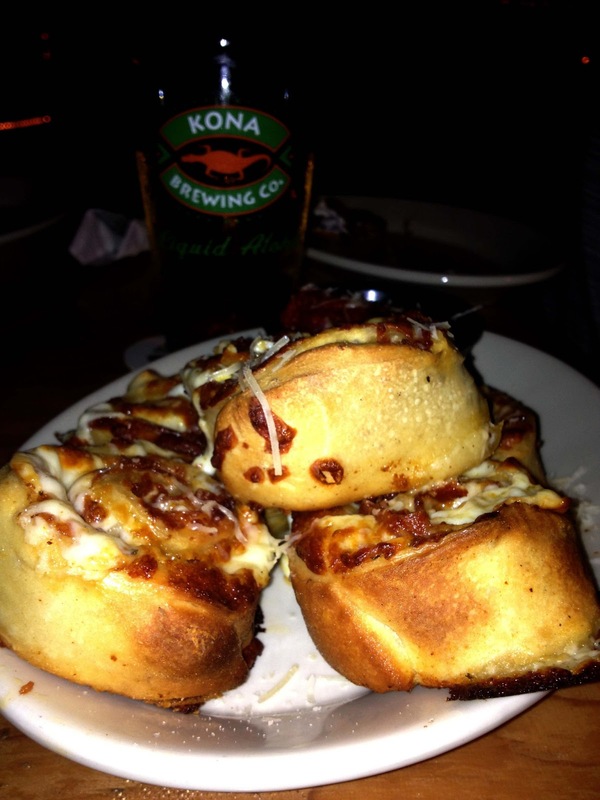 Made with dough made from beer-making grains, the rolls were spicy and perfect for any pizza lover. That and a good complement to my favorite Kona beer, the Black Sand Porter. While too full to order more, we were definitely eye-balling the Kawaihae Cajun Seared Ahi and Kona Crab Cakes at the table next to us and were tempted... but alas, that was enough for the evening. We left the huge crowds at the restaurant and stumbled our way home to relax and rest up for the Kona Brewers Festival feeling full and happy. Kona Brewers Festival week was amazing, full of delicious beer, amazing food, unbelievable sunsets, and great friends. I look forward to coming back next year and making a stop at the Kona Brewery a new tradition. The food holds its own against any gastropub I’ve been to and the taproom exclusive beers are worth seeking out. 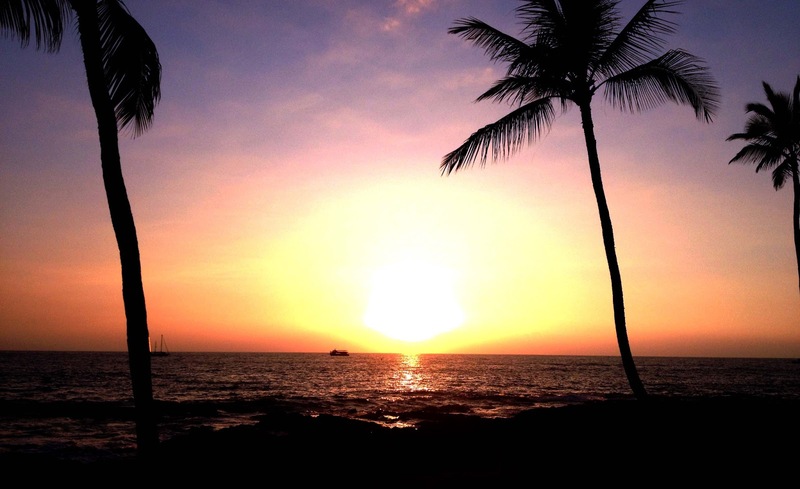 Check it out, fellow Kona travelers - you won’t be disappointed!